Hunting for commercial purposes is a major threat to the waterbuck. The International Union for the Conservation of Nature and Natural Resources (IUCN) lists the waterbuck as of Least Concern. 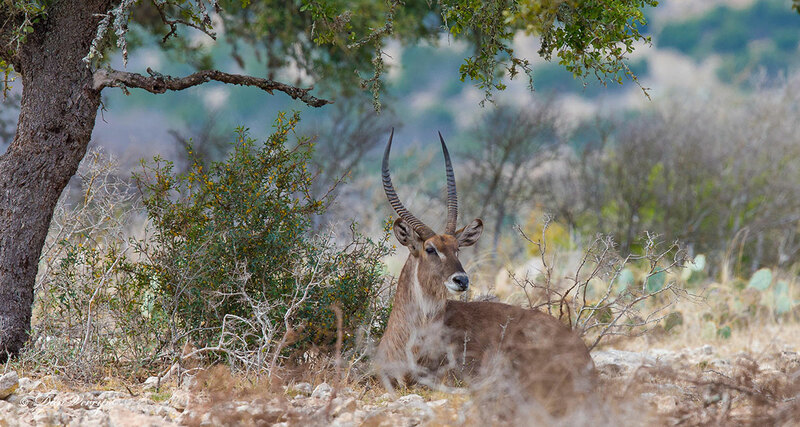 More specifically, the common waterbuck is listed as of Least Concern while the defassa waterbuck is Near Threatened. The population trend for both the common and defassa waterbuck is decreasing, especially that of the latter, with large populations being eliminated from their habitats due to Poaching and human settlement. Their own sedentary nature too is responsible for this to some extent. Numbers have fallen in Queen Elizabeth National Park, Murchison Falls National Park, Akagera National Park, Lake Nakuru National Park, and Comoé National Park. Population decrease in the Lake Nakuru National Park has been attributed to heavy metal poisoning in the animals. While cadmium and lead levels were dangerously high in the kidney and the liver, copper, calcium and phosphorus deficiency was noted. Over 60 percent of the defassa waterbuck populations thrive in protected areas, most notably in Niokolo-Koba, Comoe, Mole, Bui, Pendjari, Manovo-Gounda St. Floris, Moukalaba-Doudou, Garamba, Virunga, Omo, Mago, Murchison Falls, Serengeti, and Katavi, Kafue and Queen Elizabeth National Parks, the national parks and hunting zones of North Province (Cameroon), Ugalla River Forest Reserve, Nazinga Game Ranch, Rukwa Valley,Awash Valley, Murule and Arly-Singou. The common waterbuck occurs in Tsavo, Tarangire, Mikumi, Kruger and Lake Nakuru National Parks, Laikipia, Kajiado, Luangwa Valley, Selous and Hluhluwe-Umfolozi game reserves and private lands in South Africa.